There are certain foods that are superstars of nutritional value, simple to prepare and easy on the pocketbook yet are really kind of ugly ducklings in terms of aesthetics. If we eat with our eyes first and foremost, and if we didn’t know that these foods were not only powerhouses in being good for us AND very tasty as well, we would take one look at them and likely turn away in scorn. Take lentils for example. These tiny legumes are so rich in the good things we need for our bodies. But I imagine there’s a huge population of people simply turned off by their unfortunate lot in the food world beauty contest. Cooked to perfection and placed in a bowl, they resemble more a pile of mud than something amazing you want to eat. Now doesn’t that sound delicious?! Can’t wait to dig in! I do get it. Really, I do. 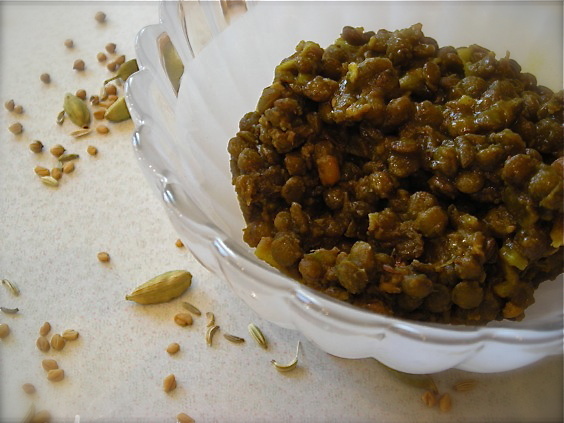 If it wasn’t for the copious amounts of fragrant dhals and mounds of aromatic Indian food that I’ve come to adore in my life, I might not exactly be in the Lentil Fan Club. But I am. And I think that everyone should. 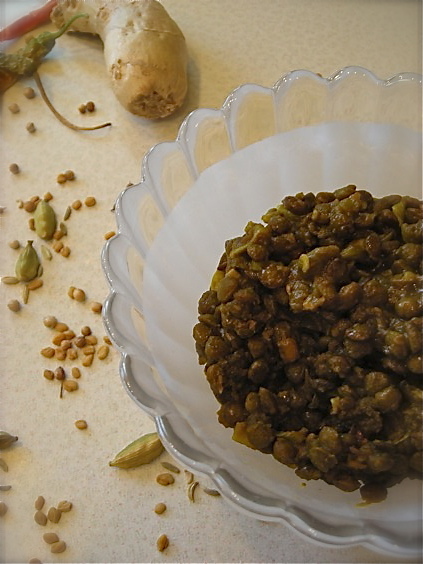 As legumes go, the lentil is one that you can take from dried form to beautifully cooked with hardly a second thought. Even the largest brown lentils will cook up nicely in about 20-30 minutes, the smaller pink and red ones turn delightfully smooth even faster, making the lentil a smart choice to keep on hand for a hearty meal. With added vegetables, it turns into a perfect soup. Served over rice, maybe with a salad and you’ve got a complete meal. Add in one of the heady fragrant spices of Indian cuisine, such as fenugreek or cumin -or in this case, both- and you’ve got a delicious creamy, slightly spicy and overall compelling meal with little more than boiling some water and a measuring spoon or two. 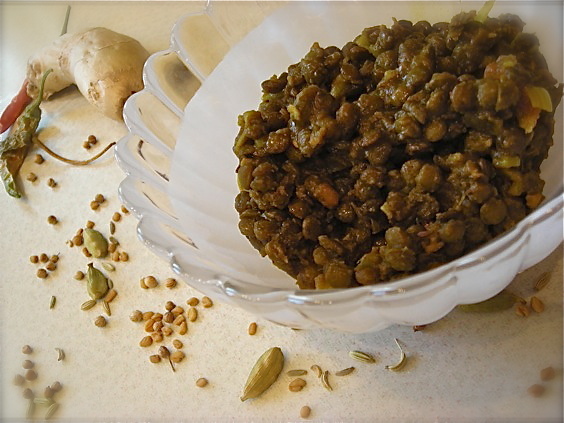 By far and away my favorite lentil is the French Puy, also known as the French Green lentil. It’s smaller than the brown, larger than the more colorful red and pink and will also cook up easily, all the while retaining it’s shape more without turning mushy. While the mushy lentil does have it’s place, I really prefer some texture to them. The Puy has a somewhat higher price tag than the brown, but I think it’s worth it. The flavor too, is deep and earthy, a bit more intense over the somewhat gritty taste I’ve come across in the brown. My first exposure to lentils was as a wee lass in elementary school. Our schooling, up until I was in 5th grade, centered mostly around a loosely defined cooperative that rented space in an old Catholic school building. We had some pretty progressive education, I guess these days it ties in best with home schooling, and one year we did volunteer work at the Renaissance Festival in a soup booth, making both Beet Borscht and Lentil Soup. I did not like the lentil soup much, but I was a kid. Forgive me for thinking it was odd among my usual repertoire of fish sticks and Rice-a-Roni. Then in college, I had a roommate for a time who was a vegetarian and loved to cook. On occasion I would tag along with her on her trips to The Wedge Co-Op, back in the long ago days when it was so tiny that barely two people could stand in any aisle. I often had no clue about the foods she would buy but I asked her endless questions and when she cooked she would share some of her meals with me. One meal was lentils, and although I didn’t fall down in love with them, I had a better idea of them than what my childhood memories had given me. Still, it took cementing my love of Indian food for me to begin actually making them at home. Once I did discover how good they could be, really there’s no stopping me now. If only I could convince The Teen to try them. One of these days, maybe. In a large saucepan, bring 4 cups of the water and lentils to a boil. Skim off any foam that may form. Reduce heat to medium-low and add the turmeric, fenugreek and cayenne. Allow to simmer, uncovered, until lentils are tender- approximately 25-35 minutes. You may need to add more water as the lentils cook to prevent them from sticking. When lentils are tender, heat a small skillet over medium heat with oil of choice. Add the cumin seeds and cook until they become dark and fragrant, and begin to pop. Add in the onion, garlic and ginger and reduce the heat, sauteing gently and stirring occasionally until the vegetables are soft, about 5-7 minutes. Stir the mixture into the lentils and blend well. If the lentils are soupy, you can raise the heat and simmer the mixture to reduce the liquid. Keep an eye on it so it doesn’t burn and stir it to keep blended. When cooked to your desired consistency, stir in the tomato. It will thicken slightly as it stands. Season with salt if desired. NOTE: It’s unlikely you can find fenugreek in anything other than seed form. To crush them, use a dedicated spice grinder if you have one, or place them in a sealed plastic bag and crush them with a rolling pin, a meat tenderizer or other hard implement. The seeds are pretty solid. Don’t be surprised if doing it by hand requires slight effort. It’s totally worth it for the flavor. This dish definitely gets better with some time to sit in the fridge. It can be made with the smaller colored lentils but keep in mind that the cooking time will be much quicker, and it will have a different texture. One cup of red lentils will need less water, about 3-4 cups. hey there, i liked reading your post, i just used the websiteSwap my Seeds, as a way of giving away my unused bagonia seeds. Anyone know what I can sell them for? I have maybe 500 seeds left. you have a nice site, i enjoyed the article. i have never, ever tried lentils, they’ve always scared me a bit. you’re post has made me want to try them, though! I love lentils now, but as a child my mother went on a healthfood kick and served “lentil loaf” which to this day tops my list of the worst food ever! I’m just glad I haven’t been scared away from the lentil forever because they are tasty! “they resemble more a pile of mud than something amazing you want to eat” HA! So true… they are quite lacking in good looks. Wow! I”m totally impressed with the photos! Lentils are definitely one of those “hard to photograph” foods! You captured their essence! Great post about lentils, Kate. Very helpful to the uninitiated. I’ve come to love the variety of lentils and cook them often. My favorite is the small green French lentil as a side dish. It is true, depending on the lentil the cooking time varies.